OK … the actor playing husband Travis Langley might have the edge there, but the SBDC will get some serious screen time, too. 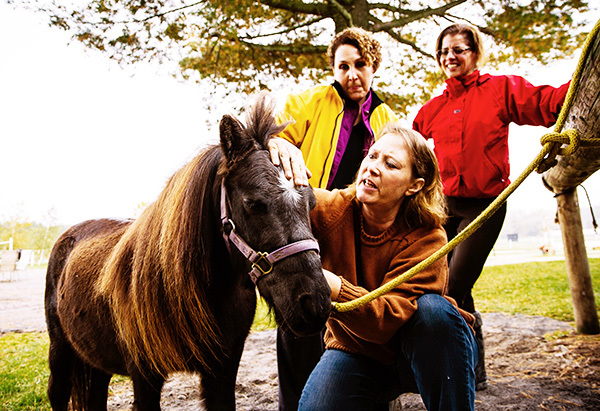 Langley has created Washington’s first state-approved vocational college especially for equine massage, and she did it while battling blindness, cancer, debilitating back pain and Lyme disease. To no one’s surprise, there’s a horse at the center of this story – Okie Dokie Colonel. Langley’s journey – from becoming an equine massage therapist to earning a human massage therapy license to opening Langley Equine Studies – has been a long one. But it has brought her where she wants to be: owning a home-based business with growth potential that she can pass on to her daughters … and loving what she does. She is quick to say she had help along the way, including her husband and friends who helped her set up an accounting system, edit her website and learn to manage Excel documents. But others are just as quick to say that what she has accomplished is remarkable. “There was no model for what Mary Lou wanted to create,” said Allan Peterson, a certified business advisor with the SBDC in Moses Lake. “She had to create it all from scratch.” Peterson, though, was both advisor and advocate from the beginning. “I don’t know if I would have been able to do this without Allan,” Langley said. Langley was a 31-year-old mother of three young children when Okie Dokie Colonel came into her life. At the time she was coping well with macular degeneration in her right eye, and riding the high-spirited quarter horse was a welcome break from other responsibilities. But when her left eye started to fail in 1997, the future suddenly seemed bleak. But she made time to get back on her horse, if only for a few minutes at a time: “Riding gave me moments when I felt freedom,” she said. But it was freedom coupled with fear. Colonel was a “hot rod,” she said, and the sight of a fluttering butterfly could cause him to bolt from one side of the road to the other in a millisecond. Langley could no longer see the butterfly; in fact, she could no longer see the road. At first she simply rode around the driveway, but gradually she was able to once again head out on trails near her home. A few years later Colonel came up lame. Experts told Langley he would be crippled within five years, but she refused to accept that prognosis either. She began investigating alternative therapies, and that’s when she discovered equine massage. Langley knows about pain. The blindness, she said, is “old news” and she has learned to deal with it. More recent health issues have included a bout with cancer, back surgery for debilitating pain that made walking nearly impossible and a 2014 diagnosis of Lyme disease. Langley Equine Studies received state approval in September and immediately began accepting students at the family’s 20-acre ranch. While the focus is on educating students to become state certified equine massage practitioners, students can also take classes in alternative therapies or enrichment such as rodeo pageant competition, dressage and general equitation. Langley’s daughters, Catrina and Ruby, and daughter-in-law Danielle – all accomplished equestrians and former rodeo competitors – are instructors as well. Langley first began meeting with the Washington SBDC’s Peterson in 2011 to discuss issues related to her own equine therapy practice and another home business creating custom rodeo wear. When she started thinking about creating a school, Peterson was one of the first people she contacted. The Washington SBDC provides no-cost, confidential, one-to-one advising for small business owners who want to start, grow or transition their businesses. It is supported by the U.S. Small Business Administration, Washington State University and other institutions of higher education and economic development. Peterson’s work is also supported by the Economic Development Council of Grant County. Even with ongoing support, Langley’s task was enormous. Washington State is the first state in the country to require 300 hours of training at a state-approved vocational school for people who want to become equine massage practitioners. (People who already possess a license for human massage need only complete 100 hours.) Because she was the first to create such a school, there was no road map to follow. She worked for more than two years with the Washington agencies on health, massage, services for the blind, education and workforce training to get the necessary paperwork filed and approved. Early on, she said, she got an email from the workforce board with 14 separate attachments on how to start a school. Many times, she said, she was close to giving up. Together, Langley and Peterson worked on her business plan, financial statements and business systems. They discussed how she could cast a wide net for students, knowing she’d have to draw from outside Grant County to keep her business viable. When Langley had doubts, Peterson urged her to stay the course: “He told me to do what was in my own heart and make my own way,” she said. What’s in Langley’s heart is to help people learn how to help their horses through touch. Last fall, she said, two students were working on Colonel when suddenly they saw the connection between what they were doing with their hands and Colonel’s obvious, dramatic response. Nearly 15 years after he was given a grim prognosis, Okie Dokie Colonel is still going strong. And so is Langley. For more information about Langley Equine Studies, see http://www.langleymassage.net/.